Maca the vegetable from Peru, South America is rapidly gaining attention around the world for it's success in supporting energy, stamina, libido and hormone balancing for women and men. Many use it to reduce symptoms of menopause, andropause and PMS. Human studies show Maca’s benefits include: Increased libido by 180%, Increased number & mobility of sperm, Reduced blood pressure, Decreased anxiety and stress. 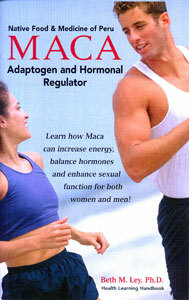 Maca is an excellent, safe alternative to Hormone Replacement Therapy (HRP) - now considered carcinogenic!